This paper presents biometric data from a collection of 488 dogs skulls originating from 58 (archaeological) sites in the northern Netherlands dating from the Iron Age to the Medieval Period. The crania were originally collected and documented in the early 20th century by Prof. Albert Egges van Giffen, one of the pioneers of Dutch archaeology and archaeozoology. The ‘De honden van Van Giffen’ project has transcribed, translated and digitized the original handwritten records and tables, supplementing the information with new photographs of a selection of the specimens, and made the dataset openly accessible for researchers worldwide on easy.dans.knaw.nl. This dataset is an unparalleled treasure trove of canid osteometric data with sustainable reuse potential for research into dog domestication, the evolution of dog breeds, and cranial variability in canids. Funding statement: Making the data digitally available in an open access environment was funded by the Koninklijke Nederlandse Academie van Wetenschappen (KNAW) via Data Archiving and Network Services (DANS) as a Kleine Data Projecten (KDP) grant. The original data and facilities for carrying out the project were provided by the Groningen Institute of Archaeology of the University of Groningen. This data was collected by Prof. Albert Egges Van Giffen in the context of his archaeological research into the faunal assemblages of the terp (artificial dwelling mound) region of the northern Netherlands (present-day provinces of Friesland and Groningen) (Figure 1), as well as the domestication of dogs. His findings about the wild fauna of this region were published in 1913 in his book ‘Die Fauna der Wurten’ , which he subtitled ‘Part I’, because he was planning to publish a second book about the domestic animals of this region. As part of this undertaking, he collected a large number of dog skulls and mandibles from the terps and studied them osteometrically, using measurements that are still in use as standard measurements today [2, 3]. However, he never managed to publish his results. Map of site locations (E. Bolhuis – RUG/GIA). In addition to the data on (domesticated) terp canids, Van Giffen collected a large amount of osteometric data on canids from other contexts, including Danish shellmiddens (kjökkenmödinger), Swiss lake dwellings (Pfahlbautensiedlungen), and prehistoric sites from Germany, as well as data on wild and domesticated canids like jackals, wolves, modern domesticated breeds and dogs from Africa. Among his paperwork there is a rough draft of the start of an article titled ‘Die Hunde der Wurten’. This article starts with: “Die Hunde der Wurten und ihre Beziehungen zu den rezenten, praehistorischen und angeblich diluvialen Hunden zu den nächst verwandten Caniden” (The dogs of the terpen and their relationships to recent, prehistoric and apparently diluvial (modern: Pleistocene) dogs to their nearest kin). This implies that it was probably his intention to bring together all the data he gathered on canids and write a comprehensive publication about his findings. As this never got finished, the data was archived by the Groningen Institute of Archaeology (GIA), formerly the Biologisch-Archeologisch Instituut founded in 1920 by Van Giffen himself. 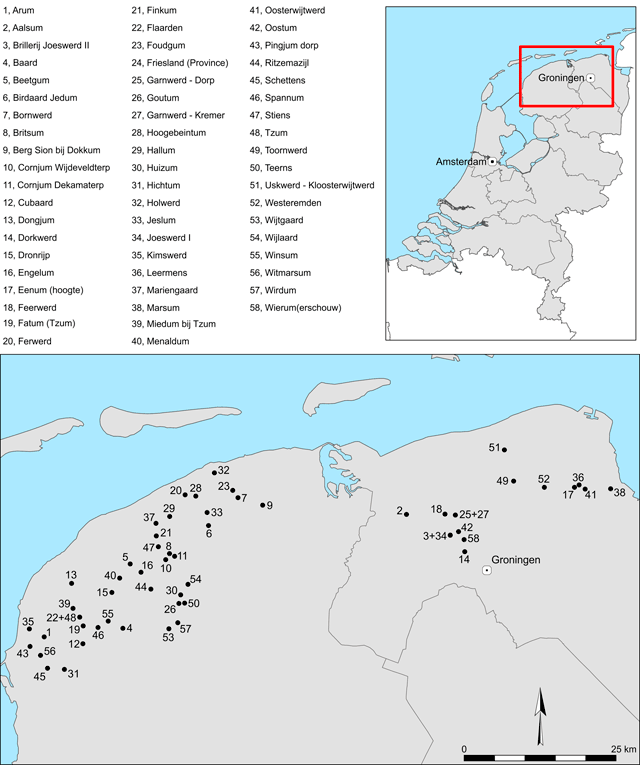 In total Van Giffen collected osteometric data from 488 specimens, origination from 58 different sites situated in the terpen area in the Nothern Netherlands. 308 out of the 488 specimens studied by Van Giffen are extant in the collections housed by the University of Groningen (RUG). The dating of the terp sites from which the skulls were gathered range in date from Late Iron Age (Dutch periodization : 250 BC – 13 AD) to Medieval (up to 1499 AD)(Table 1). In the database the dating based on available archaeological data is listed, thus the fact that some of the terps are still currently inhabited has not been incorporated in the date range listed in the database. Dating Dutch archaeological periodization for the relevant periods . The digital dataset was created by transcribing, translating (from German) when necessary, and digitizing the original handwritten records from the GIA archive, by inputting the data into a database and scanning the analogue documentation. Van Giffen’s handwritten records were extracted from the archives and assessed. Most of the data exist in duplicate: the original rough copy notes of the data, and the processed dataset. The documentation included the keys needed to interpret the osteometric data and link the measurements taken onthe skulls. The metric data and site information was entered into a Microsoft Access database and the sheets with the processed data were scanned. Extant specimens in the RUG collections were matched with the specimen numbers and cross-checked with the osteometric data for integrity. The dataset contains several tables presenting basic metric data, indices, and measurement metadata, as well as tables with background information about the sites such as site names and site coordinates (in latitude/longitude). Since the exact find location (i.e. precise archaeological context) of the specimens is not documented, the coordinates used are the central coordinates of the respective site (if an excavation area is documented) or the (former) terp body. A selection of the skulls that were present in the collection of the Zooarchaeologicial Reference Collection of the GIA  and the depot of the University Museum were photographed using a SONY ILCE-7M2 camera. The positioning of the skulls in the photographs has been based on the measurement key drawings used by Van Giffen (Figure 2). Van Giffen measurement key drawing (J. Bijtel). The dog skulls were found during van Giffen’s private excavations and excavations through the University of Groningen, as well as during large-scale removal of the terp soils for peat gaining. The current project made no further sub-sampling of the extant data or physical specimens. The measurement key used by Van Giffen was compared to more recently developed standard measurement keys [2, 3]. The interpretation of the measurement key was verified through cross-checking the recorded measurements on skulls which, by means of their index number could be connected to the respective dataset. Van Giffen recorded the sites only by name, but as they are all terps, they can be pinpointed topographically fairly accurately. For some of the finds he recorded the stratigraphic layer. These are the skulls that were retrieved during official excavations, or the removing of the terp soil under supervision of Van Giffen or one of his assistants. In the case of stray finds that can only be attributed to a certain terp, the date range can be very broad, as it is not possible to determine from which layer the specimen originates. The constraints of this data set lay in the fact that it consists solely of skulls, with or without mandibles, and in the fact that it is not always possible to deduce the exact archaeological period the measured specimen originates from. Furthermore, while the majority of the skulls are physically extant (309 out of 488), part of the remains are currently unaccounted for (179 out of 488). The original records were created in the early 20th century (ca. 1900–1920), the digitalization of the data, and therefore the creation of the deposited files was undertaken in 2017. The original data was collected and recorded by Professor A.E. van Giffen (BAI/RUG). The digital records were created by E.E. Scheele (Research Assistant Zooarchaeology RUG/GIA), D. Fennema (Freelance Photographer) made the photographic records of the selected specimens. Mainly numerical, original keys and text have been translated from German to English for the digital dataset. The dataset is accessible through the DANS-website (free log-in is required) . Cranial osteomorphology is a crucial proxy to understand past dogs and wolves [7, 8, 9]. This dataset can be used by zooarchaeologists as a reference metapopulation from the temperate northern latitudes of western Eurasia dating roughly between 500 BC to 1500 AD, for research into dog domestication, development of dog breeds in different regions and through time. 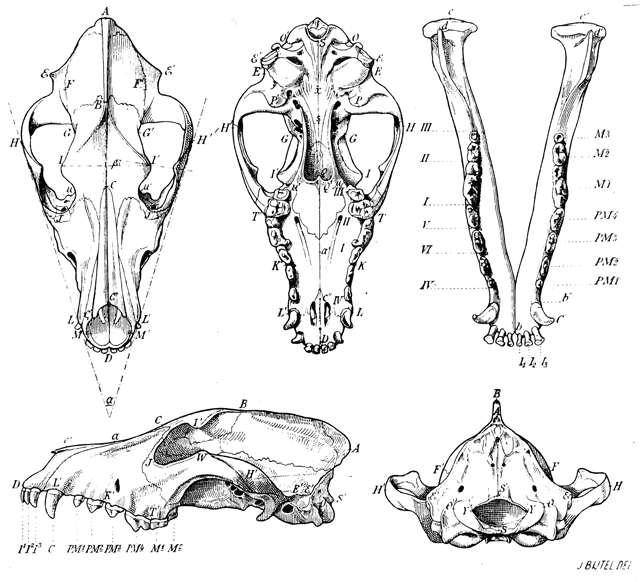 The metric data can also be of interest to researchers from the fields of biology and veterinary medicine with interest in variation in canid skull typology and their comparison with historic populations [10, 11, 12]. The dataset can be expanded with data from other datasets or data collected with the intent of extending upon this dataset. The fact that the measurements taken are still used in current research (see for example von den Driesch 1976) makes the dataset easily compatible with data from more recent assemblages from the field of zooarchaeology and recent metapopulations with more accurate metadata . In the future, it should be possible to apply molecular methods on the extant specimens and couple the results with this osteometric dataset. Finally, the dataset can be used to teach students how to re-use osteometric data to reconstruct cranial morphology. Hereby we would like to thank K. van der Ploeg (Documentalist – RUG/GIA) for retrieving the original documentation from the archives and making us aware of its existence, H.C. Küchelmann (Research Assistant Zooarchaeology RUG/GIA) for his input while translating the measurement points and keys, R. ter Sluis (Curator – University Museum Groningen) for his help in retrieving the physical skulls from the depot collection of the University Museum, and D. Raemaekers for his input during project application. Van Giffen, AE 1913 Die Fauna der Wurten, 1. EJ Brill. Von den Driesch, A 1976 A guide to the measurement of animal bones from archaeological sites: as developed by the Institut für Palaeoanatomie, Domestikationsforschung und Geschichte der Tiermedizin of the University of Munich, 1. Peabody Museum Press. Het Archeologisch Basis Register (ABR) https://cultureelerfgoed.nl/sites/default/files/downloads/dossiers/abr_website2.pdf (04.10.2017). Phillips, C, Baxter, IL and Nussbaumer, M 2016 The application of discriminant function analysis to archaeological dog remains as an aid to the elucidation of possible affinities with modern breeds. Archaeofauna, 18.